The second project meeting took place between 10. and 11. February 2011 in Samokov, Bulgaria. The aim of the project meeting was to visit different organizations offering creative workshops, talk to female self-entrepreneurs about their business set-up as well as to exchange about various handracft techniques which are practiced in the region. Please visit our online Market of Cultures and get some impressive images about the local craftsmenship of Samokov. 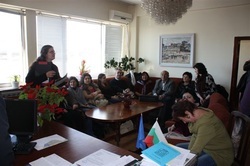 On 11th of February 2011 Mr. Angel Nikolov, the mayor of the municipality Samokov welcomed the YOCAIT project partners in his office. Irena Ignatova-Koen, the Bulgarian project coordinator introduced the European project "You can do it" - New perspectives for women to have own businesses" as well as the project partners from Italy, Estonia, Germany, Hungary, Czech Republic, Lithuania and Turkey. Mr. Nikolov showed greatest interest for the creative project and he underlined the importance of creating new businesses in Samokov especially because of the high unemployment of young people in the region. The most of the small and medium businesses in Samokov are set up in the field of tourism, particularly in the hotel industry and gastronomy. "But Samokov has much more potential" - explained the mayor. The city looks back on a long tradition in craftsmanship. But unfortunately the city does not benefit from it yet. "The tourist areas are flooded with cheap imitations" - reported Ani Yoveva, the President of the Ladies´Embroidery Club. "We already tried to sell our handmade products, but unfortunately with very low success. Handmade products are more expensive and because the imitations look almost perfect, only very few tourists are interested in buying original handmade products. "-explained Ani. "We encourage women to make their hobby to their business and offer courses on start-ups". In 2010 70 women participated in the course ´Start up your own business´ and four of them established her business.